See what makes our probiotics different. Cage-free turkey is the #1 ingredient. No rendered meats or by-product meals. Turkey, lentils, sunflower oil, natural flavor, salmon oil (source of DHA), DL-methionine, dicalcium phosphate, calcium carbonate, salt, choline chloride, taurine, dried Lactobacillus plantarum fermentation product, dried Bacillus subtilis fermentation product, dried Lactobacillus acidophilus fermentation product, dried Enterococcus faecium fermentation product, dried Bifidobacterium animalis fermentation product, zinc proteinate, vitamin E supplement, niacin (vitamin B3), manganese proteinate, copper proteinate, zinc sulfate, manganese sulfate, copper sulfate, thiamine mononitrate (vitamin B1), vitamin A supplement, biotin (vitamin B7), potassium iodide, calcium pantothenate (vitamin B5), riboflavin (vitamin B2), pyridoxine hydrochloride (vitamin B6), vitamin B12 supplement, manganous oxide, sodium selenite, vitamin D supplement, folic acid. Some cats may require more or less food than the guidelines depending on activity level and other factors. For pregnant or nursing adult cats, we recommend free-choice feeding. Remember to keep fresh water available to your pet at all times. 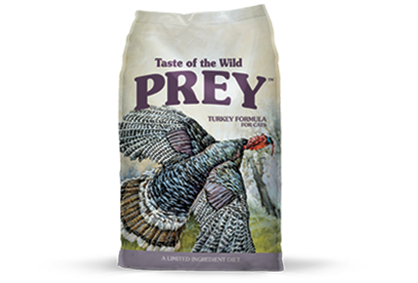 Taste of the Wild PREY Turkey Formula for Cats is formulated to meet the nutritional levels established by the AAFCO Cat Food Nutrient Profiles for All Life Stages. Turkey Formula for Cats is rated 4.5 out of 5 by 224. Rated 5 out of 5 by debb from My Cats LOVE Prey Turkey I brought home a bag of Taste of the Wild Prey Turkey for my cat’s to try, after feeding another grain-free food for a couple of years. My 6 month old kitten would never touch the dry food I had been buying. When I got home with Prey, I put a little down for them to test their interest. They both ate every bit of it. They LOVE it. Bonus for me: I scoop their litter daily, and after a week I’ve noticed it no longer smells. I’m quite serious about that. I have to special order Prey through a small, local pet store chain. It’s worth it, but I’d appreciate it being more widely available. Prey will be the only dry cat food I buy from now on. Rated 5 out of 5 by loveituseit from My cat can be extremely picky when it comes to his food. Sometimes even with food that he has been give for months, he will all of the sudden do the dreaded "kick" where he fake buries it in our house with his paws. That means that he is over it and doesn't want to eat it, even after begging for food. With this product, he definitely didn't kick at it, and ate it up quickly. His favorite treat is fresh boiled chicken and turkey, so the all natural ingredients probably played a huge role in his satisfaction over the meal. We are so happy that we were able to try out this brand free through a voxbox and can't wait to try more from the brand. Rated 5 out of 5 by brittanis1 from I am really happy that I was included to test this cat food out for free thanks to PREY and influenster. My cat literally loves this cat food. I slowly introduced the food to him as treats. Then started mixing it little by little into his food. Soon I switched to give him this food alone. I did this to make sure it did not upset his stomach and he liked it. It worked great and he absolutely loves it. I would definitely recommend this cat food as my cat seems to really enjoy it! Just if you do switch foods, my only caution is to do it little by little which this brand also recommends! Great cat food and great company. I will definitely purchase this food and brand again! Rated 4 out of 5 by shequeitert from I received this product complimentary for my pets to try. I received 2 small bags of the Turkey formula for cats. I have 3 domestic cats, they never go outside but there are lots of window sills and tables they can climb on so they get an adequate amount of exercise. I first introduced the formula to them as a cat treat to make sure their stomachs could tolerate it. My cats liked the formula just fine but only one of them would rush to the bowl when I was serving it. Overall, I think they enjoyed it but considering the price and how fast my cats went through it, I probably won't switch to this exclusively. If I can find small bags, I may use it as a treat for my pet who liked it the most. Rated 5 out of 5 by the_boss_witch_tabi from AMAZING. I am going to tell you why in this long post. Cats need a strong balanced nutrient rich food. But an indoor cat needs not too much protein and not too much fat, because they won’t be burning it in the home. This is an amazing balance for indoor. One of the highest allergic ingredients in cat food is chicken, and chicken is EVERYWHERE in cat food. In almost everything. I give my cat the Turkey because it is bird. And in the Wild, my cat would be catching birds for dinner. Turkey is awesome because it’s not high in calories or fat, but is great for protein. Also this brand does not add in bad or toxic ingredients. This brand is all I will give my cat because they truly understand cat nutrition. Rated 5 out of 5 by tnwalker1 from Cats dove right in Been using Taste of the Wild Venison for the cats. It's all my Ragdoll girl will eat. Both cats dove right in. Hope to try the Beef flavor next ! Rated 5 out of 5 by amandab35 from I received these products complimentary from Influenster for testing purposes. My cat is an indoor, eight year old, white, angora. She loved this food! I have a few brands/varieties of food I rotate, all of which are specifically for indoor cats. Up until trying this I thought that was important to look for. She has long fur, and while I do brush her often, there are unfortunately times she throws up after eating. (Sorry if this is TMI, lol) it isn’t a hair ball, and when it happens it’s RIGHT after she eats. While she ate Taste of the Wild, I think I can count on one hand the amount of times she puked! The ingredients are pretty lengthy, but the first several ingredients are REAL foods and I felt good giving Sugar this food! What is the magnesium content? Hello, we apologize for our delayed response! Our PREY Turkey Formula for Cats contains 0.12% magnesium on an as-fed basis. Hello and thanks for reaching out! The kibbles in our feline recipes are shaped like a round disc and are about the size of a pencil eraser. Please know, we select all of our ingredients with the health and well-being of your pet in mind. Our sunflower oil is purified from sunflower seeds and provides a rich source of omega fatty acids. If you have any questions, please contact us by visiting our website https://www.tasteofthewildpetfood.com/#contact-us. 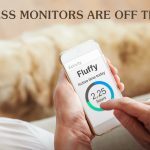 Do you offer any programs or specials for non-profit rescues? Hello, Michelle! 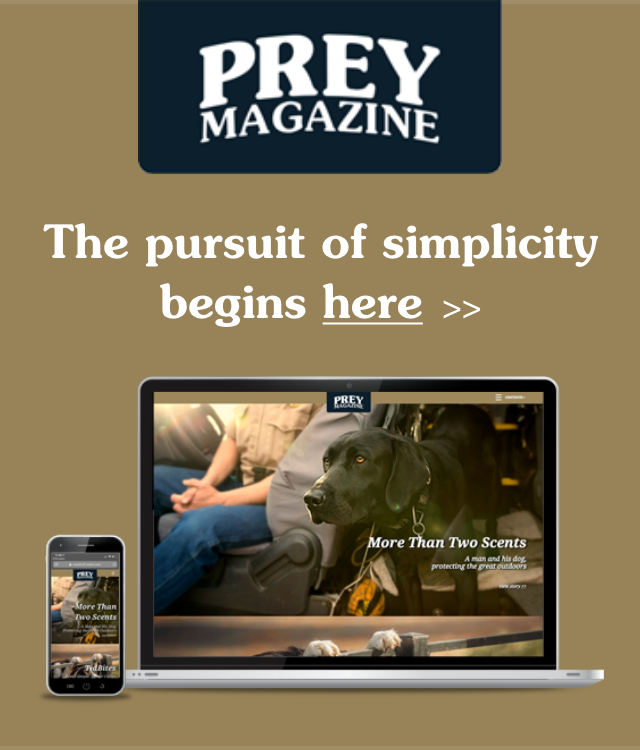 Although we do not have a program specific to non-profit rescues, our authorized retailers offer a PREY loyalty program. With this program, when you buy eight bags of the same size and formula, you get the ninth bag free. To find your local retailer, please visit our website https://www.tasteofthewildpetfood.com/where-to-buy/. What is the carbohydrate percentage on this particular food? Hello, thanks for your question! This formula contains 34.3% carbohydrates on an as-fed basis. I have a cat with skin allergies and a heart condition, so I&rsquo;m trying to find a limited ingredient food with a low salt content. Do you have any limited ingredient foods with less than 0.30% sodium on a dry matter basis? Thanks! Hi, Erika! We&rsquo;re sorry to hear about your cat&rsquo;s skin allergies and heart condition. We do not have any restricted sodium diets for cats. You may need to consider a prescription diet for your cat in order to meet your desired sodium level. Please know, our PREY Turkey Formula contains 0.44% sodium on a dry matter basis. If you&rsquo;re interested in our Taste of the Wild recipes, our Canyon River Feline Recipe contains the lowest amount of sodium with 0.38% on a dry matter basis. If you have additional questions about any of our recipes, please contact us by visiting our website https://www.tasteofthewildpetfood.com/contact-us/. Is this food considered low in sodium? Hello, Court and thanks for reaching out! Our Turkey Formula for Cats contains 0.40% sodium on an as-fed basis.&nbsp; Please know, all of our foods are formulated to meet AAFCO regulations. If your cat requires a restricted sodium food, we recommend working with your veterinarian to determine a diet based on his/her needs. How can I get a sample of this Prey non GMO cat food ? Turkey . Hi, Rich. We&rsquo;re excited to hear about your interest in Taste of the Wild PREY! To obtain a sample, please visit your local retailer (to find one near you, visit https://www.tasteofthewildpetfood.com/where-to-buy/?cs=ml). You can also contact our product specialists at 1-800-342-4808 (8 a.m. &ndash; 5 p.m. CT weekdays) or at https://www.tasteofthewildpetfood.com/contact-us/ to see if they have samples available. Should they be out of samples, we do have a satisfaction guarantee on our products if it doesn&rsquo;t work out for your cat. Thanks! I have 4 cats and one of them has had urinary tract issues. &nbsp;I currently mix a urinary formula with the dry food. &nbsp;Is your Turkey formula good for cats with urinary issues due to the magnesium content? Hello and thanks for reaching out! While we do not offer any prescription diets or diets labeled for cats with urinary tract issues, our Turkey Formula for Cats contains 0.12% magnesium on an as-fed basis. We recommend consulting with your veterinarian to determine the best formula for your cat&rsquo;s needs.